Exciting Estonian sounds in which the old and new collide and spark. Trad.Attack! has really turned Estonian music scene upside down by bringing traditional music to the big stages, building modern world around its archaic sounds. It is often said that the band with its three members sounds so big that you would think there’s much more people on the stage. They take traditional songs – sometimes starting with scratchy recordings of long vanished village voices – and build pulsating rhythmic structures, creating an impressively big sound from acoustic 12-string guitar, drums and an array of whistles, bagpipes and jew’s harps. All three band members grew up with music around them and each had been active on the Estonian music scene for more than 15 years before they started Trad.Attack! in 2014. In the beginning it was meant to be just simple, fun and experimental. Surprisingly for the band, their first tune “Kooreke” became a hit in Estonia… Since then the band has received 19 Music Awards in Estonia, released their debut album “AH!” recognized internationally and toured in 33 countries from China to Canada, including significant showcase festivals as WOMEX, Eurosonic and Transmusicales. They’re still a bit surprised about their success but definitely having lots of fun. In May 2017 they released their new album “KULLAKARVA – SHIMMER GOLD” and currently touring with it around the world. From July 2017 – December 2018 Trad.Attack! will celebrate Estonia holding the Presidency of the Council of the EU and Estonia’s centenary celebrations with a tour “ALL AROUND EUROPE” which will reach each EU country. 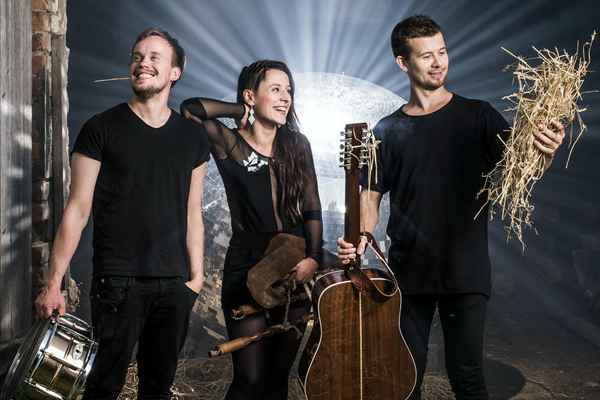 ESTONIAN ETHNO MUSIC AWARDS 2014 – Band, Album, Song, Newcomer of the Year and Radio 2 special award of the Year.